XVII century, Caribbean sea. At the helm of your mighty vessel, you scour the horizon with your spyglass. Profitable sea lanes are just waiting to be claimed... But a rival ship is fast approaching your prize! Can you sink them before they send you swimming? 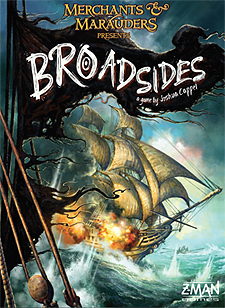 Merchants & Marauders: Broadsides brings you back to the golden age of piracy with this 2-player game where you and your opponent are engaged in a deadly battle hoping to sink each other's ship. Load your cannons, aim, and unload everything you've got at the enemy!